Lucy’s ipod case, originally uploaded by the workroom. I have to admit, I’ve been feeling extra busy this week. I have a list of things to do that is pages long and it keeps growing. There are lots of great things in the works, but sometimes I get so caught up in all the details. Luckily, Lucy and her sister Sophie came in to do some sewing today. Lucy is 10 years old and her sister is a few years younger. 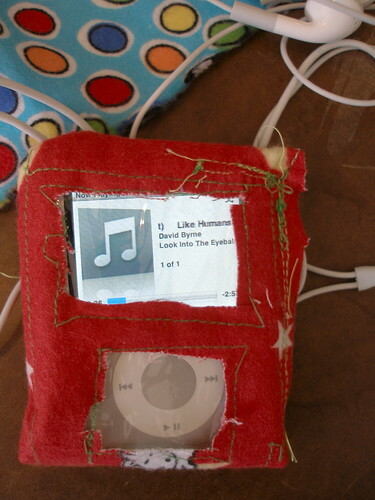 It was their first time using a sewing machine and they wanted to make cases for their new ipods. This is what Lucy made, ON HER OWN. She cut out windows for the screen and wheel and put in clear vinyl, the opening at the bottom folds to the back and is secured with velcro. The design even accounts for having the earphone cord plugged in while it is in the case. I stepped away from my silly list to watch Lucy discover sewing and just dive in to do it herself with hardly any help. It was her very first time and look at the amazing thing she made. Do you remember the first time you used a sewing machine? I wish I could. I have vague memories of making a black tote bag on my own, perhaps during my ‘black clothing’ phase in high school, but I doubt that was my first time on the machine. angelune – I’ve never seen you use a sewing machine. You’re always doing handwork when we craft together, crochet, english paper piecing, etc. Are you going to bring your quilt to quilt sunday this week?